QuickFlirt is a one-stop-shop for singles to chat and meet new people, build relationships for long term romance, or simply find other single men and women looking for some no strings attached fun. With over 110 million chats and over 1 million active users every month, there’s no shortage of flirting to be had. Women chat for free on QuickFlirt which attracts both sexes to the party. The website offer 24/7 customer support and is 100% secure, leaving you to feel confident browsing and chatting with new people. QuickFlirt boasts that most people meet their soul mate in their first month of signing up, so why wait? There are various ways to meet new people and make the most of a subscription with QuickFlirt. Every user has a Match Feed where they can see singles who might be a good fit for them based on their own profile. Singles can also use the search filters to narrow it down themselves. Once someone looks great, users can reach out by instant chat or inbox message, or even use SMS chat. They can head to the chat rooms to speak to more people and indulge in some flirty banter, and use webcam as well as audio chat directly from the site itself. Singles can send out Flirtcasts to more than one member at once, and show you are interested by sending winks, flirts and profile views. Create lists of friends, or even blocked members, and try out the fun and simple Android app if you want functionality on the move. Signing up to QuickFlirt only takes a few minutes and new members will not be required to fill out lengthy personality tests. The only info that is required for sign up is age, gender, email address and a password. Before any new member can begin using the website, QuickFlirt sends out a verification email in order to verify the user's identity. Once this simple process has been completed, users will be redirected to build a short profile. 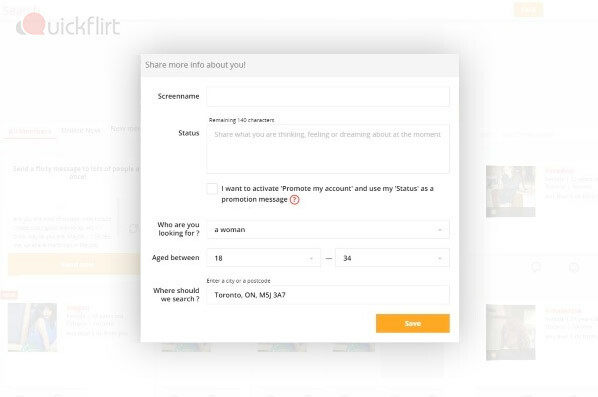 This includes choosing a screenname, making up a status, verifying the location, and choosing an age range which potential matches will be chosen from. Profiles can be changed as regularly as users want, so there is no need to feel too pressured to come up with the best possible status right now. Quickflirt allows singles to search by only verified profiles, which is a great extra safety tool. They do not have a lot of additional safety tools, for example there is no option to browse in private. However, QuickFlirt does have an option to block members, as well as an option to report any abusive members. Users can contact the staff admin by contact form from the help center, and by telephone if there are any problems. Signing up will unlock premium support so that any issues will be dealt with even more efficiently. Women chat for free on QuickFlirt, but both men and women will want to upgrade to get the most out of all the features of the site. Among other bonuses, a paid membership unlocks large photos, premium support, an extended search tool, and seeing what other users are looking for. A 3-day trial for just $0.99 per day is a great idea for singles who are new to online dating and would like to try out all the functionality. 1 month is the most expensive option, for $27.99, and the price drops to $18.99 per month if singles commit to a 3-month subscription. The cheapest choice is 6 months of full functionality for only $15.99 per month. On top of that, Quickflirt offers a satisfaction guarantee which lets users try any of their dating sites for three days for free at any of their dating sites if they do not meet someone within 3 months. The QuickFlirt Help Center has more than a dozen categories to help users understand every element of the site. These include account details, billing questions, mobile options, chatrooms and successful dating tips. The whole site is very easy to use, with step by step instructions, popups which are helpful rather than intrusive, and a 24/7 way to get in touch if users need any more support. All the features of the site can be found from the home page, or by clicking on your own image in the top right hand corner of your screen. We love the helpful mobile app for Android devices, which makes it even simpler to keep on top of all interactions. Singles can search directly from the home page on QuickFlirt. Simply enter the gender you are looking for, pick an age bracket, a location and whether they have a photo. Singles can also be filtered by whether they are online and available for chat immediately. Narrowing down the search further is also available, simply by opening up the full search filters. Ethnicity, religion, income, body type and education are all options, as well as drinking, smoking and piercing preferences, and even whether the member is verified. A fun and casual atmosphere, with no skimping on safety. Quickflirt allows singles to chat by text, audio or webcam, search by Canadian singles who live nearby, and indulge in flirtation from desktop and mobile. Prices start from $15.99 per month, and it is easy to see why they attract over 1 million monthly members.